Anyone who is my age or near my age has Quentin Tarantino to thank for knowing about this song. We also have "Q" to thank for this song being associated with the removal of a police officer's ear with a straight razor by Mr. Blonde in Reservoir Dogs. I must say that the scene was a bit startling when I first saw it. The sheer sociopathic cruelty displayed by Michael Madsen as Mr. Blonde in the scene certainly had an effect on me at such an impressionable age. Over the years there have been few who have played the part as well as Madsen (see Kill Bill Vol. 's 1 & 2 or The Getaway). Sure, the scene is gruesome. The actual removal of the ear ins't shown, but later when the "stump" is shown as Mr. Blonde throws gas on the cop, it's almost as bad as showing the ear being removed. What's more interesting is Tarantino's choice of music for such a grizzly scene. It's such a light-hearted sounding song for a heavy scene, but it fits. It gives a soundtrack for Mr. Blonde's cruelty, a soundtrack he can sorta dance to before mutilating another human being. Not only does the song provide the soundtrack for the scene, but I think it may refer to the cop's physical position being stuck in the middle of Mr. Blonde and Mr. Orange, who is just out of frame and eventually saves the day. I suppose it could also refer to Mr. Orange (an undercover cop) who is stuck in the middle ("Clowns to the left of me / Jokers to the right") of a botched jewel heist. There's a great article (with video) on The A.V. Club all about this scene here. 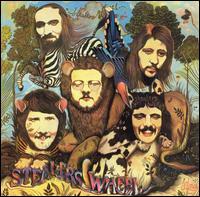 Moving on...Stealers Wheel was a folk band founded by Joe Egan and Gerry Rafferty (one of my favorite songwriters). Rafferty also wrote "Baker Street" and "Right Down the Line," which is featured on this site here. The band was short-lived, producing three albums in three years. Many times this song is mislabeled as a Bob Dylan song due to Rafferty purposely aping his vocal and songwriting style. Apparently the song is based on true events which had Egan and Rafferty sitting at a restaurant table between record execs and producers. The cowbell is one of those big, clangy ones. It can be heard at the end of the chorus during the refrain of "Please...please..."
Many artists and bands have covered the song. It seems to be fairly popular with country artists with Juice Newton, Keith Urban and the Ranch, and Collin Raye doing versions. I am disappointed that Eagles of Death Metal's version (alternately title "Stuck in the Metal") does not have any cowbell, while many songs of their songs feature it. Also, the soundtrack for Reservoir Dogs is of note for the other cowbell songs are featured on it besides "Stuck in the Middle with You." Bedlam - "Magic Carpet Ride"